Reviewed in half a sentence: A successful entrepreneur, bodybuilder, business coach, and psychologist, Matthew Michalewicz, suggests five doors you must walk through if you’re serious about achieving success. Here’s the other half of the sentence: as long as you define success as financial success. Knowing what to do allows you to see the path; knowing how to do it allows you to follow the path. The book begins by noting that if the age of the universe was a year long, your expected lifespan would be about one half of a second. Bang! Ya burnt! You shouldn’t waste a single morsel of the time you have because—bang!—it’s over. It’s a pretty clever construction. Matthew Michalewicz wants to get you moving toward your goal. As a scholar of psychology, he knows that there’s something keeping you from achieving your deepest-felt goals. He wants to get you over that something. Fast. Establish clear goals, write them down, and share them. This section includes some difficult to swallow statistics, such as “people with goals earn nine times as much over their lifetime as people without goals.” Just the definition of the word “goals” would be enough to keep the debate about the truth of this statement going longer than your half second. “No burn, no earn,” might be a half-second way of summarizing this chapter. For Michalewicz, Persistence = sustained desire; I like that! The section includes a nice riff on the joys of stream-of-consciousness writing (the author throws down in the closing chapter of the book). The cliché of every self-help book shows up here: your belief helps make it real. The only nuance of originality here is the suggestion to surround yourself with people who have been super-successful in your areas of interest. This chapter is worth the time it takes to get here, and includes numerous insights, like the use of goal pyramids and the gut realization that ownership of assets is the path to financial success. Michalewicz is not 100% on-board with the “go to college” advice. He parrots it, but deep-down he thinks it’s a fallback in case your passion doesn’t pay. 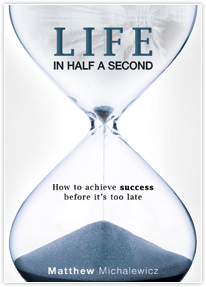 Is Life in Half a Second worth spending a portion of your precious time on? Yes! It delivers enough clever ideas combined with a coach’s encouragement to get you off your keester and working on those life goals. Michalewicz came up through bodybuilding, and he has a Schwarzneggian philosophy that is infectious. The only way you will ever become wealthy is by being an owner, not a worker. The one major blindspot in this bright, quick guide is the equation of financial success with success itself. The author cops to this, basically saying that financial success makes so many other kinds of success possible that pursuing it until you can achieve those other goals is a sound strategy. It reminds me of yoga. Matthew Michalewicz is a physical guy (though for some reason no photo of his handsome physique appears on the cover) so I’m sure he’d appreciate the analogy to an exercise that takes little time and produces major benefits. But yoga is more than exercise. Yoga literally means “yoke,” or to attach yourself to something—in particular, a path. Just as there are many paths to success, there are many yogas, including hatha yoga (the body), raja yoga (the mind), bhakti yoga (service to others). Marriage is considered a yoga. When you marry, when you have a child, you attach your success to another’s. You get in a harness and your goals are not yours to decide. The author mentions his partner only slightly, his family slightly more. If you’re married, if you have kids, you don’t have purely personal goals. The advice in the book becomes harder to apply. There are paths to success that do not involve financial success. In fact, in the end, almost no one wants money—only the goods and services it can be traded for. If you pursue financial success, you are pursuing nothing, and you’ll realize that as soon as you get it. Better to yoke Michalewicz’s advice to the real goal, the ultimate goal, whether that be fame, happiness, a family, adventure, or whatever works for you. Then pursue it, whether the money follows or not. I did what’s in this book—nothing more, nothing less. I set my goals from my dreambox, changed my environment to match my goals, mapped the path to success, invested in myself, burned the midnight oil acquiring knowledge, and always, always took action. Even when I feared it the most. My life turned out the way it did because I designed it that way—it wasn’t accidental and it didn’t happen by chance… and you can do the same. What I’ve done, you can do.